My blogging is desperately lagging behind real life, which I guess is how it should be. I have loads to tell you : a whole series on installing our horizontal plant filter and beautiful wildlife pond system of treating our grey water; our forthcoming VIP dry toilet to complement it; a distressing infestation of red mites in the henhouse; preserving this year’s tomatoes by bottling and boiling, as opposed to the more energy-intensive freezing, which is what we’ve done to date; making cider vinegar for the first time; various cream’s made from marigold petals, shea butter and other stuff by Gabrielle with successful medical trials (well, a thumbs up from a couple of mates whose skin didn’t peel off) green building; our village baker’s 40th birthday party and so much more. 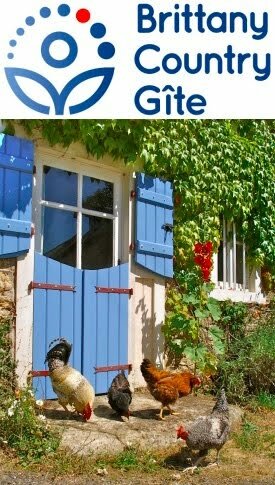 Firstly, I would like to thank Stonehead,Valand Albert for their helpful advice about the size and shape of our two Berkshire piggies/hogs (see my two previous blogs). Secondly, a tale of a long and busy day on a surprisingly hot and sunny September Brittany day, with frustrations and delays, heavy stones and a squashed left little finger, an all-day-English-Breakfast (at lunchtime) the stonemason decamping immediately afterwards, then a wash-up, change of clothes and a drive to the supermarket to buy beer and then a relaxing hour in a French bar in Dinan called “The Tally Ho Pub”, run by a Frenchman and selling real English bitter (albeit out of a bottle). The grey water treatment system installers, Christophe and Sylvain, have scaringly left us. 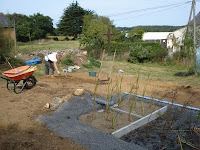 Whilst the plant filter is now operational, the wildlife pond has plenty of work still to do on it. We need our friend Paddy to finish the capping stones on the “dam” before we fill the pond up to verify that the levels of all the earthworks are correct. There are some subtleties, such as the bog garden being just higher than the pond overflow, so as not to empty the pond, but to be able to be watered by the pond in a controlled way if we plug the overflow when it’s raining. I’ll explain more in subsequent blogs, suffice to say is enough to make me pass several of the small hours looking at the ceiling of our bedroom with m mind spinning. Paddy is at least as busy as us. We’d fixed the RDV for yesterday morning at 8.30, so I had set the alarm, the animals had been launched into the new day and the concrete mixer set up in time for his arrival. In typical impatient-and-also-underestimating-what’s-involved way, I assumed it’d be all done by lunchtime, after which he would have to return home to look after baby Florence and be available to collect Lola from school so Kay would go off and teach business English. A precise job like good stonemasonry by an ex-Fell farmer needs quite a bit of contemplation before action and after much muttering and wandering around with a tape measure, he pronounced that the stones that I’d left in the field next to the sheep were ideal and not the heavy stones that I had moved, with great difficulty next to the pond … ho hum. Then there was the matter of the flat stone for the overflow, which turned out to be ever-so-slightly convex, needing much reflection, then lots of work with angle grinder and toothed chisel. Then a wonderfully flat stone donated by neighbour Serge turned out (turned over?) to have a very uneven bottom, needing another half an hour with angle grinder and chisel. 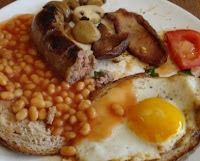 To cut a long story short, we laid two stones in half a day (and squashed my little finger) before a late “lunch” of an “All-Day-English-Breakfast” of our own home-produced bacon, sausage, egg, tomatoes and (supermarket, oven-ready) chips and a very English mug of tea. It was a fiercely hot and sunny day so, after the evening rounds of the animals, I cleaned up and put the tools away before heading off to a local supermarket (the Intermarché at Taden) to stock up with English bitter, one of the few things I really miss about England. Amusingly, due to the heavier tax on alcohol in England, it’s actually cheaper here! 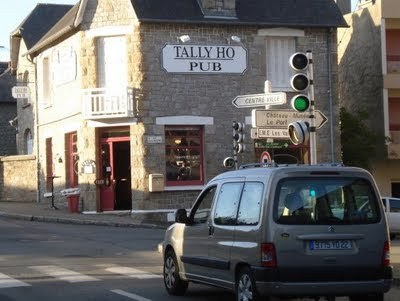 On the way home, I felt obliged to investigate the newly opened “Tally Ho Pub”. Bonjour. I then asked the French bar owner if he had English beer and he pointed to three pumps : Murphy’s stout (which I pointed out was actually Irish) Heineken (no English connection other than one can buy it in England) and Strongbow (English but cider). 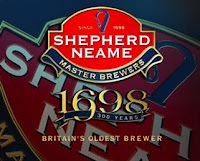 As my smile dropped and my bottom lip began to quiver, he said that he had got bottles of Spitfire (genuine English bitter from the Shepherd Neame brewery). Compared to the bargain at the supermarket, it was exorbitant at 5€, nevertheless the ambience was good and I found it very relaxing being away from the distractions of things to do at home, with just a pint and a magazine : simple pleasures ... Cheers!